Last month I introduced you to the double clip brooch – a two-in-one jeweled accessory that made its debut in the 1930s. Because you can wear this type of jewelry as a brooch or as separate clips, it is as versatile today as it was decades ago. 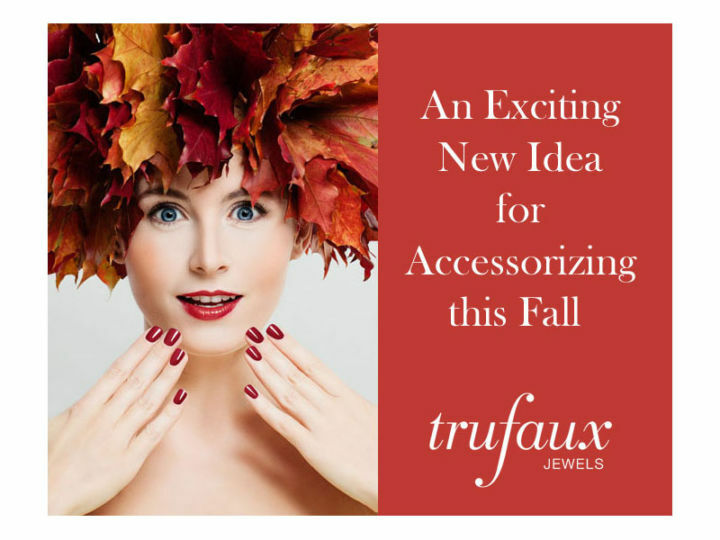 Now that autumn’s here, how about trying a new type of accessory that’s perfect for this season? Here are four jewels styled with contemporary fashions in a color palette appropriate for the piece. The items shown are staples that you may have in your closet. 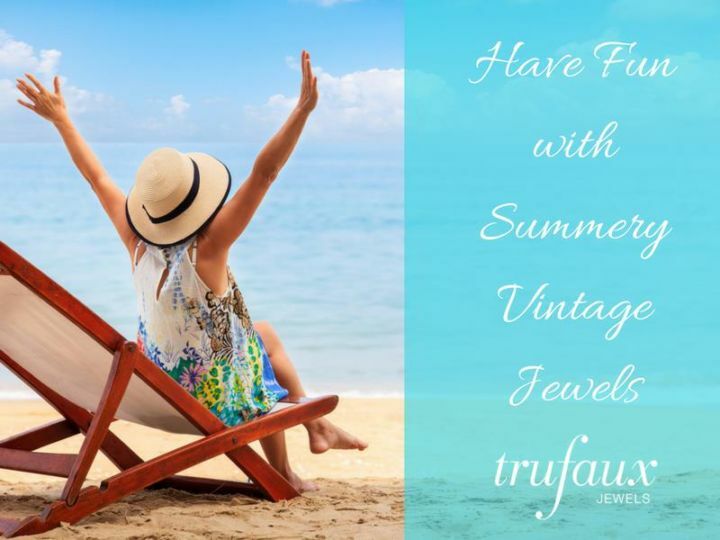 One of the goals of my styling tips is to inspire you to refresh your existing wardrobe with vintage costume jewelry. This Diamanté Winged Art Deco Brooch by Coro (made in the 1930s) is featured on the lapel of a blazer in Favorite Look. The wool blazer can support this brooch. Because of the linear nature of the design and many of the stones, I’ve emphasized that characteristic with stripes in the shirt, checks on the purse, and pointed-toe flats. The black, grey, and blue hues are perfect for a cool palette. And diamond studs (real or faux) are a great choice. Taken off the frame, the brooch becomes two dress clips. I’ve continued the linear theme with my choice of pieces for the next two outfits. One is more casual – you don’t have to dress up to wear these jewels. 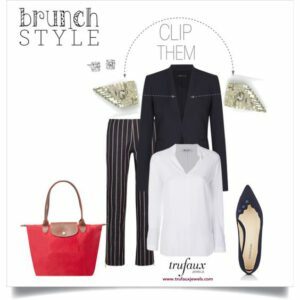 In Brunch Style, the clips are fastened to the edges of the v-neck blazer without lapels. Again, the wool jacket can hold the dress clips. 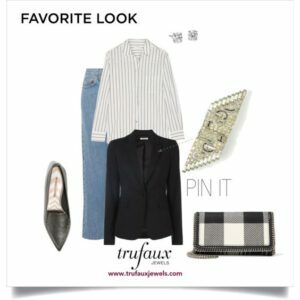 Striped jeans, a v-neck shirt, and pointed-toe shoes complete this look. For evening, be Gorgeous shows the clips at each end of the square neckline of a wool sheath. Black accessories, which include an Onyx, Diamanté & Sterling Line Bracelet, carry on the linear theme in cool colors. With an all-diamanté jewel, I like to wear diamond studs. From the 1950s, this Emerald & Diamanté Pansy Brooch by Hattie Carnegie also goes well with a cool palette. Because of the rounded edges of this piece, I’ve emphasized this shape in necklines and accessories. 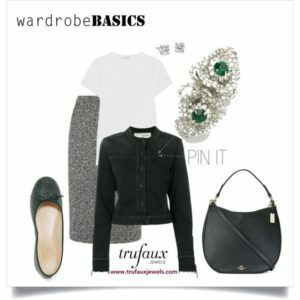 Wardrobe Basics features the brooch pinned to a black denim jacket, a fabric with enough weight to carry the jewel. You could wear a wool blazer instead. Because I love deep green, I chose ballet flats in that color. You could pick up the green in your bag instead, or wear black accessories. If you wear earrings, faux or real diamond studs work perfectly. This brooch also separates into a pair of dress clips. 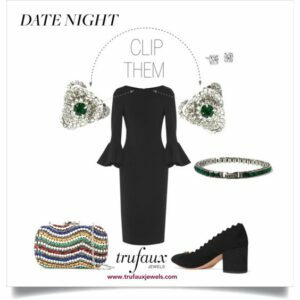 Date Night shows the clips on the round neck of a wool dress with fluttering bracelet-length sleeves. 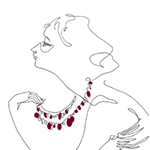 That sleeve length is perfect for this Emerald, Diamanté & Sterling Art Deco Line Bracelet. In casual LUXE, the clips adorn the round neck of the wool cardigan. I chose dark green shoes, but you could wear black or navy. Faux or real diamond studs are a great earring to wear with both outfits. This Emerald, Ruby, Pearl & Diamanté 1950s Brooch by Hattie Carnegie is mounted in gold-tone metal, so I’ve decided to use it with a warm palette. Because of the round and tear-drop shaped stones, you’ll notice rounded edges in the outfits. This colorful piece suggests many options for clothing and accessories. 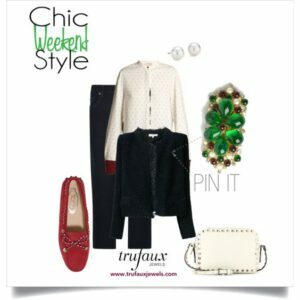 In Chic Weekend Style, I’ve played up the red with the print and cuffs of the blouse and the loafers. You could wear trousers and dressier shoes for an office-ready outfit. The navy wool jacket can hold the brooch well. I’ve added pearl stud earrings, but you could easily wear real or faux diamond studs or even gold ball studs. Unique shows the pair of dress clips at the neckline of a collarless jacket. You know I love green, so I’m sure you aren’t surprised to see the dark green pants and the wonderful plaid (also a favorite) shoes. 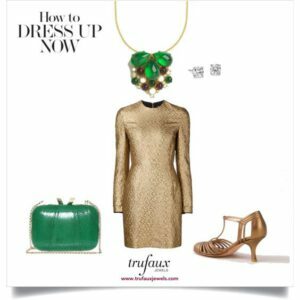 How to Dress Up Now illustrates how a single dress clip can be worn as a pendant on a chain. I chose a round-neck gold sheath as a backdrop for this jewel and repeated the emerald green in the bag. For both outfits, I’ve shown diamond studs, but you could wear pearl studs instead. The last example highlights another piece that suggests a warm palette – this Sapphire, Diamanté & Gold Spiral 1950s Brooch by Coro. It’s a Duette that separates into two dress clips. Instead of a triangular-shaped hinged mechanism with teeth, each clip has a pair of prongs. Don’t be alarmed by the notion of prongs – their diameter compares to that of a brooch. You just need to attach the clips to sturdy fabric, such as wool. 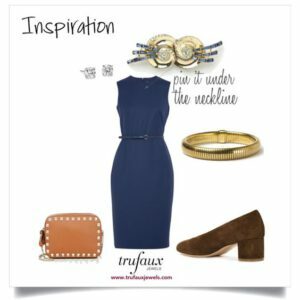 All three outfits are based on a round-neck navy wool sheath, with dark brown round-toed shoes and a gold-studded, light-brown bag with rounded edges. Diamond stud earrings and a Gold Flexible Spiral 1940s Bracelet complete the accessories. 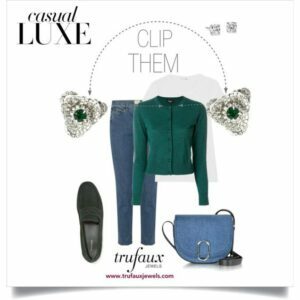 In Your Look, the brooch is pinned to the shoulder of a camel-colored, collarless wool jacket. Inspiration shows the brooch again, but this time it’s pinned horizontally, just below the neckline. In Style, the fur clips are attached at the neckline, for a different effect. 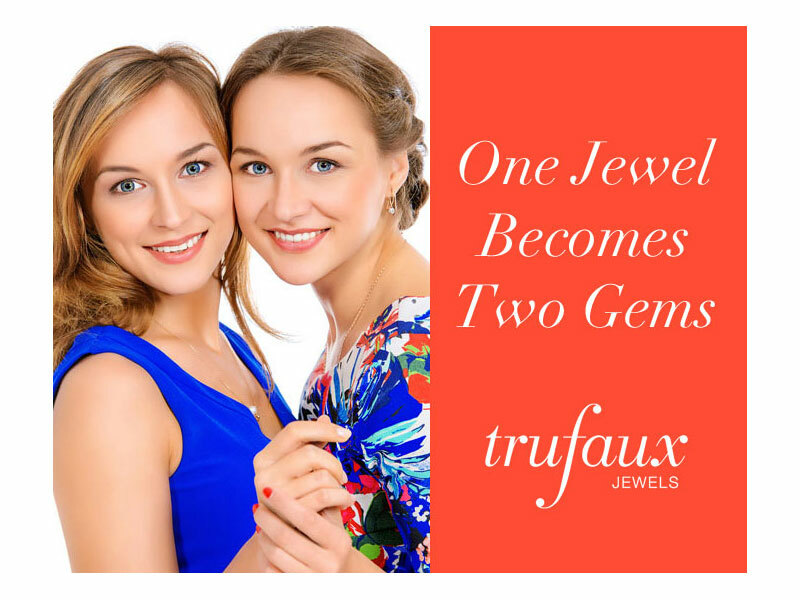 Check out the collections of Double Clip Brooches, Dress Clips, and Sets & Parures in the TruFaux Jewels boutique. Read my blog post What Color Looks Best on Me?.